(Bloomberg Opinion) -- Lyft Inc. filled in a few blanks Monday about its closely watched initial public offering. The company can’t answer the essential question of whether its business is viable or what price investors should put on the company’s potential and its pitfalls. First, the new hard numbers. Lyft disclosed in an amended investor document that it plans to sell about 30.8 million shares in its IPO at an initial proposed price of $62 to $68 each. The number of shares and the price will most likely change before Lyft hits the stock market next week or thereabouts. 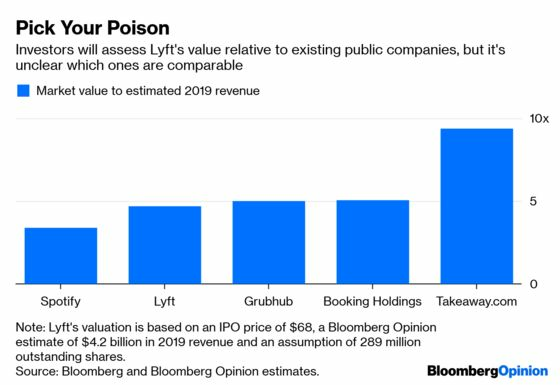 At the high end of that price price range, and making a guess about Lyft’s net revenue for 2019, the company’s initial proposed IPO valuation of up to $19.6 billion would be around five times the company’s revenue — about in line with a company like restaurant delivery company GrubHub Inc., which also matches buyers (hungry people instead of riders) with sellers (restaurants instead of drivers). Is GrubHub or any other public company the appropriate financial yardstick for Lyft? I don’t know. No one does, really. As I’ve written before, the tricky thing with Lyft — and particularly for its rival Uber Technologies Inc., which is also planning an IPO— is that their businesses are unlike anything that came before. That’s good, but it also makes it difficult for potential investors to feel confident that they’re paying the right price given the potential reward and the potential risk that the on-demand ride business isn’t financially viable or as large as optimists believe. I suspect Lyft’s IPO will go fine. 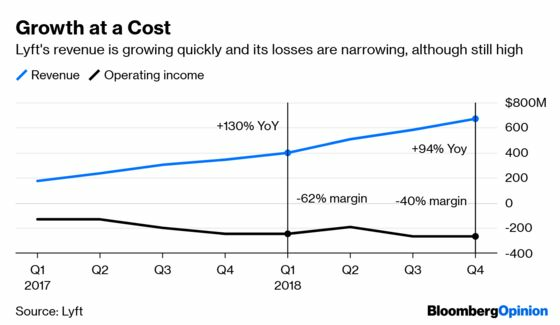 It will be hard for investors to ignore its growth, with revenue that has doubled year-over-year, although it’s not clear whether this rate is a result of a company rigged for growth. Valuation is a niggling question in the IPO. Either an investor believes it’s worth rolling the dice or she doesn’t. Price is a secondary consideration. So, too, is the company’s stock structure. Thanks to a special type of stock, Lyft’s co-founders together control just less than 50 percent of the company’s voting power, giving them an effective veto on most corporate decisions. These supersized voting shares are commonplace among young technology companies — and I’ve exhausted my complaints on this subject — although Lyft’s voting stock comes with a twist of the knife. Unlike some other technology companies whose founders also have outsized voting power thanks to special shares, Lyft’s unequal stock was created recently rather than in the company’s early days. That means the board made a conscious decision in the lead-up to the IPO to grant Lyft’s co-founders 20 votes for each of their shares in Lyft. I would like to hear directors’ justification for their decision. A group of investors is pushing back on the share structure. My colleague Matt Levine wrote about why this happens. It’s not that investors won’t care about founders with outsized power and are happy to overlook it when they’re deciding whether to buy Lyft’s stock in an IPO. It’s that founders of young superstar tech firms like Lyft have more bargaining power than public investors do. There are few elite companies and many potential buyers of stock. Lyft is in that Silicon Valley superstar category. Now that it’s graduating to the public stock market, eventually corporate governance and potential valuation will come to matter. My rough estimate for Lyft's 2019 revenue is $4.2 billion, which assumes this year's growth will match the 93 percent increase in net revenue from the fourth quarter of 2018. The valuation is based on 289 million shares outstanding, which reflects the shares Lyft plans to sell in its IPO and the potential extra stock allotted to Lyft's bankers. The number of shares outstanding excludes some of the company's equity held by employees and others.